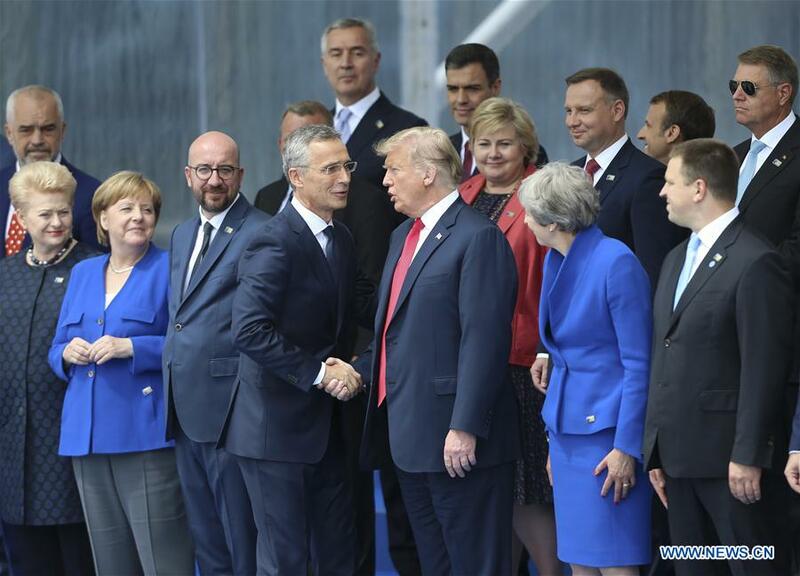 The North Atlantic Treaty Organization (NATO) summit began Wednesday in Brussels with verbal fireworks as recent tensions between allies and the United States were laid bare by U.S. President Donald Trump in a growing row over burden sharing and foreign influence. Setting the tone for the summit's first day, President Trump made waves Wednesday morning at a meeting with NATO Secretary General Jens Stoltenberg when he accused Germany of being under the sway of Russian interests. "Germany is totally controlled by Russia because they will be getting 60-70 percent of their energy from Russia and a new pipeline," Trump told reporters, calling the alleged dependence on Russian energy "inappropriate." "On top of that Germany is just paying just a little bit over 1 percent of GDP on NATO defence contributions whereas the United States is paying 4.2 percent of a much larger GDP. So I think that's inappropriate also," Trump claimed. According to the latest NATO estimates, Germany spends 1.24 percent of GDP on defense, while the U.S. spends 3.5 percent. The claims stem from criticisms about burden-sharing that Trump has made since just prior to his inauguration in January 2017. In addition to referring to NATO as "obsolete" at the time, he blasted allies for not meeting 2 percent defense spending commitments. Since his inauguration, Trump has argued that fellow NATO allies have been leaving the United States to foot the bill for their joint defense. According to NATO figures, only five of the 29 members have met defense spending targets this year: Estonia, Greece, Latvia, Britain and the United States. German Chancellor Angela Merkel hit back at Trump just a few hours after his remarks, arriving at NATO headquarters to say that Germany had contributed a lot to the defence alliance. "Germany is the second largest provider of troops, the largest part of our military capacity is offered to NATO and until today we have a strong engagement towards Afghanistan," Merkel said, adding: "In that we also defend the interests of the United States." The German Chancellor also addressed the accusation of Russian influence, saying "I have experienced myself how a part of Germany was controlled by the Soviet Union. I am very happy that today we are united in freedom, the Federal Republic of Germany. Because of that we can say that we can make our independent policies and make independent decisions. That is very good, especially for people in eastern Germany." In remarks later during the summit, however, President Trump increased pressure on allies over burden sharing, calling on allies to double defense spending targets to 4 percent, the White House confirmed. "I think we should first get to 2 percent, focus on that now... the good thing is that we are moving to that," NATO Secretary General Stoltenberg told reporters, without speaking directly to Trump's comments. The U.S. president has been the source of concern for many European allies, in and out of NATO, with European Council President Donald Tusk warning Trump Tuesday to "appreciate your allies, after all you don't have that many," and reminding that "America does not have, and will not have a better ally than Europe." The spike in tensions comes as President Trump is preparing for his first-ever summit with Russian President Vladimir Putin in Helsinki, Finland, in less than a week, sparking worry among allies. Meanwhile, the first day of the NATO summit also saw allies trying to strengthen the defense bloc, with several decisions made related to improved capacity, and even a formal invitation to Macedonia to join as the newest member of the organization. Praising new initiatives to build capacity, NATO Secretary General Stoltenberg estimated that as much as 266 billion additional U.S. dollars would be spent by European allies and Canada on defense by 2024. He also announced the agreement of "Readiness Initiative," including the "Four Thirties" to be ready by 2020: 30 mechanized battalions, 30 air squadrons, and 30 combat vessels, ready for use in 30 days or less. The organization also extended a formal invitation to Macedonia to become the 30th member of NATO, following the recent thaw in relations between the country and its neighbor Greece. Macedonian citizens will first have to ratify an agreement with Greece, which had long blocked NATO membership for the small Balkan country, which would change its name to "Republic of North Macedonia." The two-day NATO summit will continue in Brussels on Thursday, with meetings between allies and the presidents of Georgia and Ukraine.